I suppose this is not the most spectacular compilation of Senegalese music imaginable, but in the 1980s it did fill a gap in my appetite for more, after getting into contact with the likes of Number One and the early Etoile records. But, as I said, it is an interlude. Preparing this post has been quite an emotional experience. And not only for the passionate music, but also for the memories of a trio of friends that have now gone. 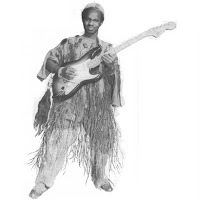 With the death of Zani Diabaté none of the men, who met at the Ballet National du Mali and who subsequently decided to 'do their own thing' on the side by starting the now legendary Super Djata Band, remains alive. Alou Fané, singer and dancer, master of the kamalen n'goni, proud member of a blacksmith family and a unique personality, was the first to go, over fifteen years ago now. A loss felt to this day. 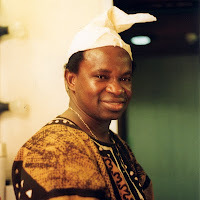 A few years ago saw the death of Daouda 'Flani' Sangaré, musical researcher, extraordinary singer, terrific dancer, sought-after romantic (very popular with the ladies), but also a man who had experienced the deepest depths of misery - after losing his parents at a young age and then (in the last decade) his second and finally his first wife -, and a warm and caring friend. And now Zani, the first and last with the Ballet, who besides a spectacular and unique guitarist was a dancer, multi-instrumentalist (with a background in djembe and other percussion instruments), bandleader and organiser, driving force, as well as being a (in my opinion: too) modest and very friendly guy. I would like to use the music of Zani and his friends of the Djata Band as an illustration in this tribute. A few of these tracks I have posted before, but most you will find nowhere else. Those recordings were made in a private ambience, at concerts or even by Zani himself. 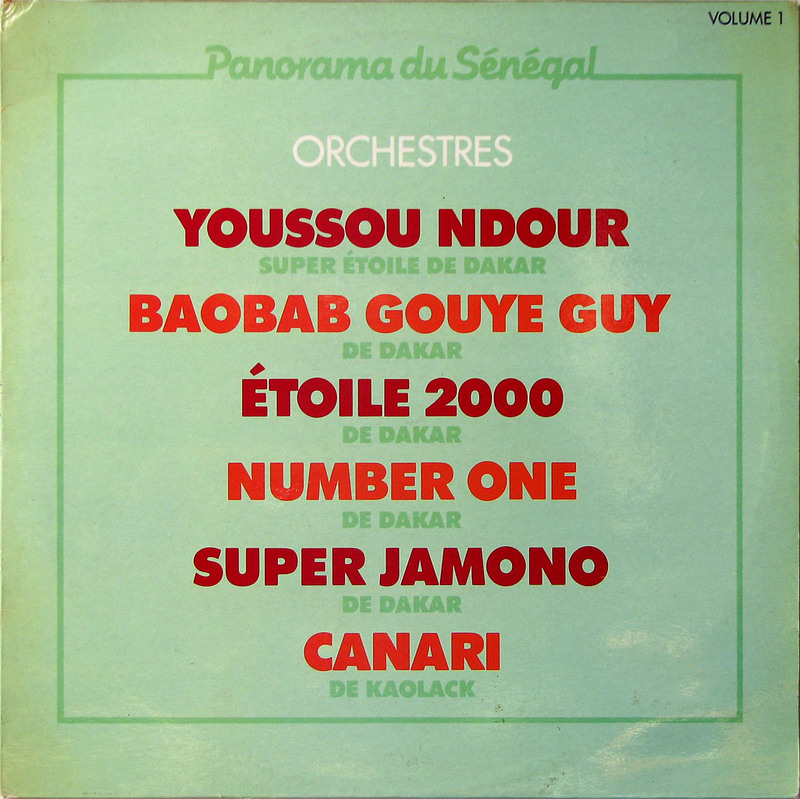 A track from the early 1980's and recorded at the Radio Mali studios in Bamako. 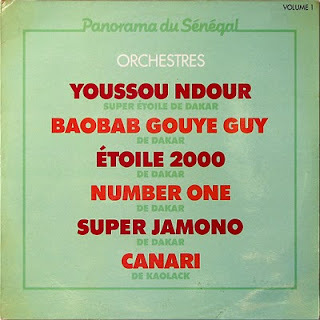 This is in fact a medley of donso n'goni songs, made popular by the great Toumani Koné. It starts off with Zani frantically setting the pace in a tune known as "Dangoroba". Flani is singing the lead, with Sidi* Touré backing him. 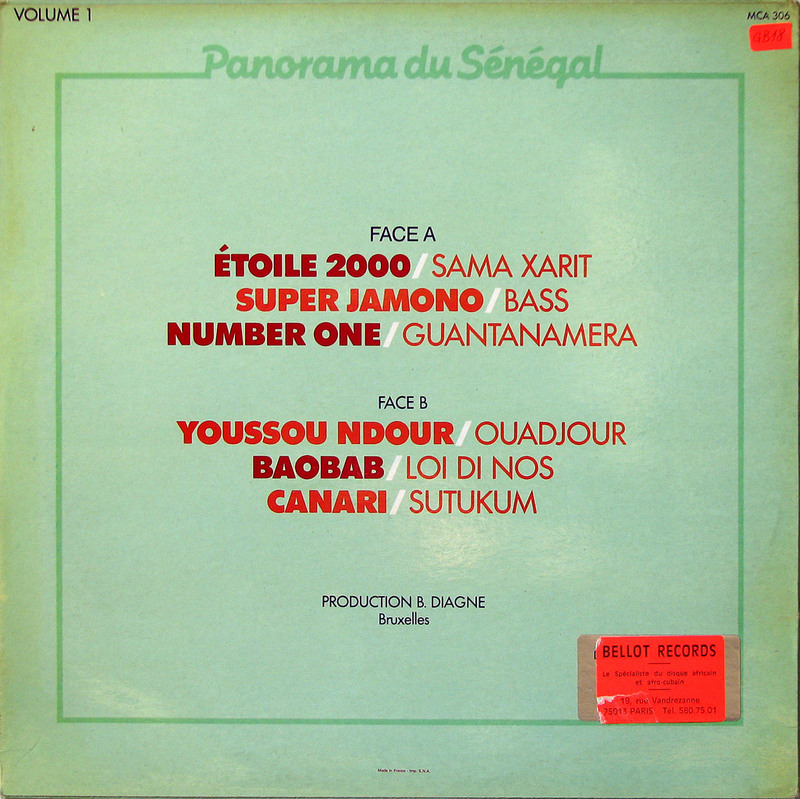 After 1'24 the band seamlessly moves into what is probably "Gon Magni" (see 5), followed after 2'40 by "Noumouna Kouloumba". 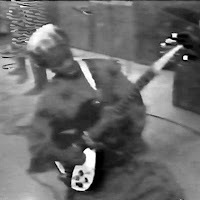 Note how Zani uses the guitar to imitate the shooting of a rifle (e.g. at 1'45). After 4'22 wanders off with a solo that illustrates his fantastic rhythmic skills, as he meanders around the main rhythm but always gets back on the right spot. The medley ends with a version of "Baba", a track covered many times by other artists (in various forms). A recording of a session at my place, almost exactly twelve years after the previous song, of a song made famous by Super Biton from Segou. Flani was a good friend of Biton singer Mamadou 'Percey' Doumbia. This song was never part of the Djata Band repertoire, so you can hear Zani switching to more suitable chords, displaying a great talent for improvisation. Zani and Flani were in Holland to perform in the 'Opera Bambara' with the title "Fura". I'll post more songs from this session at a later date. From the same lp as #2 (and yes, I did post this one before) and clearly recorded during the same session, with the same suppressed sax. The two songs may seem very similar at first, but there are a lot of differences. For one, Flani is singing with Alou replying, together with Sidi Touré. This is a song from Flani's roots in the Ganadougou district near Sikasso. My impression is that this was originally a balafon song. Because the monotony of the rhythm the impact of Zani's solo from 2'55 is all the more intense. Again he shows his love for Hendrix's music, but he does so in an amazingly functional way, because it just increases the effect on the dancing and twirling, - which I know must have gone on when this was recorded. After 4'58 the sax player actually discovers that his microphone has not been switched on, and is allowed some 30 seconds of audible contribution. This is certainly one of my top favourite Djata songs. After the two video versions I posted (here and here) here is a third version of this song dedicated to Zani himself. This is from the same concert and recorded by the same person as #3. Attentive listeners may have noticed that this is in fact the same song as "Bomama" by Super Biton. In his solo, after 3'08, Zani does a series of acrobatics, rolling on the floor and sliding his guitar underneath his body. Alou's singing after the solo, however, is somewhat below par. This song does give a good impression of the reception the band got from Dutch audiences. From the same session as #4. The recording begins by me trying to explain which song I was refering to in a discussion that took place earlier. The original, of which I play a few seconds, was by Flani and Alou and their kamalen n'goni act. Zani needs a few moments to recall the song and Flani helps him by singing a few lines from the song. After a while Zani decides it is better to keep the guitar playing monotonous to imitate Alou's n'goni of the original. This certainly gives the song more pace, and goes on 'till the break at 4'25. The subsequent variations again show Zani's skills as an improviser. This is a song from the very first recording of the band in the Netherlands, on December 18, 1985, at the Melkweg in Amsterdam. It was recorded by VPRO Radio, under the guidance of the late Dave van Dijk. The track starts off with the balafon of Bakari Diabaté, Zani's younger brother, who died some years later. Again perhaps not the best version, but a good illustration of how difficult it is for western engineers to get the sound right. They have a strong tendency to 'normalise' all the instruments and singers within a group, i.e. to record all at roughly the same volume. This tendency has had some dramatic results over the years, the most remarkable being the mixing out of Franco's guitar in the recordings of the 1986 concert in Utrecht (this was 'rectified' in the re-release of the lp). And while we're on the subject: besides being a fan of Jimi Hendrix Zani was - like so many African guitarists - perhaps an even bigger fan of le Grand Maître. Franco's influence is apparent not by Zani playing Franco-like chords, but rather by the boldness of his guitar playing, the choice for an own original sound and - on the level of the guitar playing itself - the awareness of the power of repetition. Recorded at the Van der Valk Hotel in De Bilt (near Utrecht, the Netherlands) a few days before #4 and #8, this is a truely sparkling version of the Djata Band classic "Facia". Flani improvises with the lyrics to sing about their friend Alou Fané, who had passed away five years before. Zani is filling in both the rhythm and the solo. Such a delightful song! As a comparison, here is the version of the same song performed by the complete Super Djata Band, in their optimal line-up, during a concert in Angoulême, France, in 1984. This was, by the way, the first performance by the band in Europe. To round off this tribute another song recorded at the Radio Mali studios in Bamako in the early 1980s. With the title meaning "Good evening Mali", this is a version of a Na Hawa Doumbia song. It is sung (solo) by Flani, who was very friendly with Na Hawa and her husband N'gou Bagayoko, and visited them whenever he came to or passed through Bougouni (where Flani's eldest son lives). While Flani attempts to recreate the 'modest' atmosphere of Na Hawa's song, Zani offers a contrast with a spectacular and 'full-scope' solo from 2'47. Towards the end, from 5'30 onwards, Flani cites the names of the band members. The 11 songs can also be downloaded as one file here (new link March 7, 2014). PS: the photo on the top-right was taken by myself at his home in (I think) 1990. One of my resolutions for the new year is to post more traditional music. I am well aware that the distinction between modern and so-called 'traditional' music is at times not as clear as it may seem. A lot of modern music is at the very least inspired by themes, topic and tunes handed over from one generation to another, - or in other words by tradition. 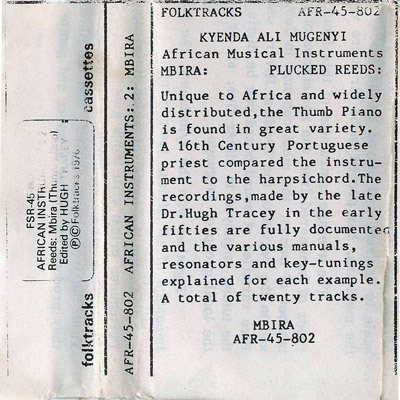 The production of this cassette betrayes the pure amateur love for the music by the people at Folktracks (who don't seem in any way related to Folkways), with pre-computer printing and tightly folded, but extensive sleeve notes. 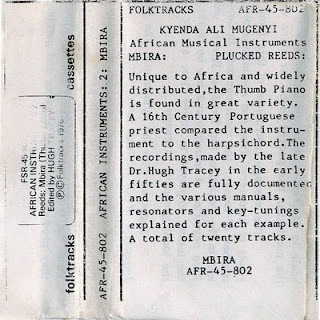 From the archives of the International Library of African Music (ILAM) they have compiled 20 songs featuring the mbira, or sanza, or likembe, or thumb piano. The artists in these recordings have been fully credited. And there are some legends among these. 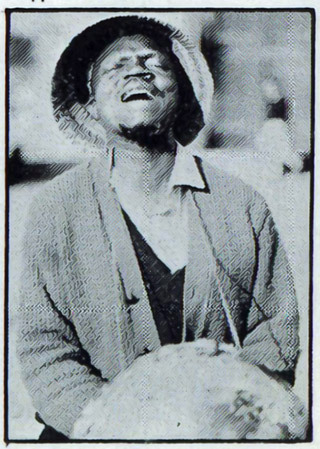 Like Zimbabwean mbira legend Simon Mashoko ("Saimoni Mashoko" in the notes - photo on left). For others these recordings are possibly the only ones that were ever made of them. I particularly like the tracks by Ngaina Lolo (A2 - love the resonance), the one by Simon Sitale (A8 - the mbira like a blanket for cold ears), the storybook-like "Kemai" by Kayoka Ladislas & Beya Marcel (A10), the very Zimbabwean sounding track by Baranganani Mudzanani from South Africa (B3) and the soulful song for the chief by Chabarwa Musanda Mayo Sinyoro** (B4). * And please feel free to suggest additions. ** one person or two? At the beginning of this new year I would like to wish you all the very best! I am starting this year with some music from a country which has so far remained unmentioned in this blog. There is a very good reason for this: I know next to nothing about it, can't read and don't understand a word of arabic, and a generally a total stranger to the - no doubt - wide range of cultures in this vast country. I have never been to Sudan, and the cassette I would like to share with you was not bought in Sudan. Well, at least not in the country we now call "Sudan". The cassette (on the right) does carry an indication of where it was bought: "BMDA" stands for "Bureau Malien du Droit d'Auteur". So the cassette was bought in the early 1990s in the former French Sudan. 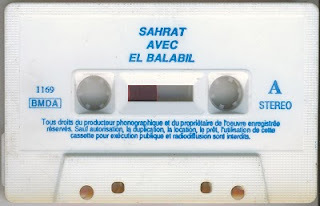 In fact, there were quite a few cassettes of Sudanese music available in Mali, and I may post another later. 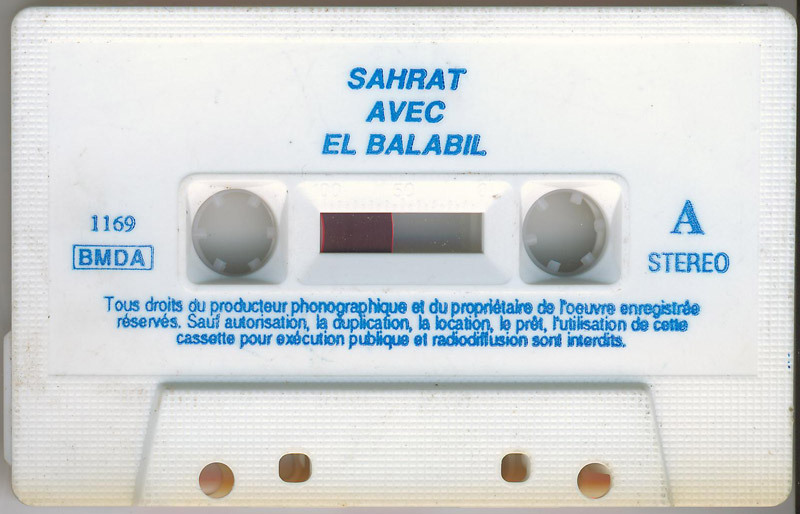 You can read more about the artists featured on this cassette, Al Balabil, on the GhostCapital blog, although I hasten to add that the information is limited, and I get very itchy when African artists are labelled as African versions of western stars (in this case "The Supremes of Sudan" - aaaaarghh!). I have no video of this female vocal trio, but I do have some videos of other Sudanese artists. One of my favourites is this one, by Kamal Tarbas, of whom many videos can be found on YouTube. I just love the relaxed 'ambiance' of this video, recorded (sometime in the 1980s) on the banks of the Blue (or White?) Nile. And the music is simply wonderful.